We discussed and proposed sliver and ticket semantics of the API. Points still outstanding include decisions on whether a ticket is consumed upon redemption (which is strongly related to whether a sliver carries an implicit promise for the resources it holds, or whether that promise must be made explicit in another ticket held alongside it), and what facilities should be made available for holding multiple tickets and/or promises in various sliver states (necessary to implement two-phase commits). Note that both require additional requirement, and neither of these nor any others have yet been agreed on. 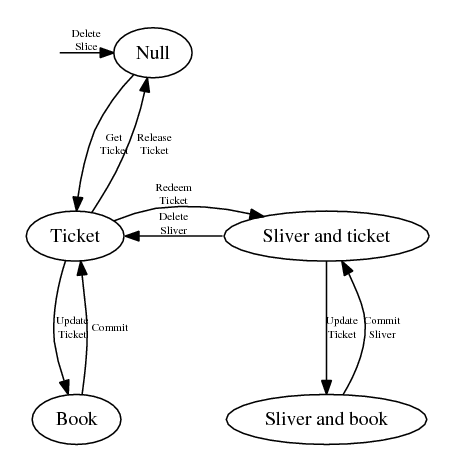 Additional possibilities include a scheme without books, but where redeeming a ticket does not consume it (like the second diagram above, but redemption would lead directly to the "sliver and ticket" state); and another alternative similar to the first which also allowed a state with both an instantiated sliver and a book of two tickets, where neither ticket corresponded to the resources currently held.